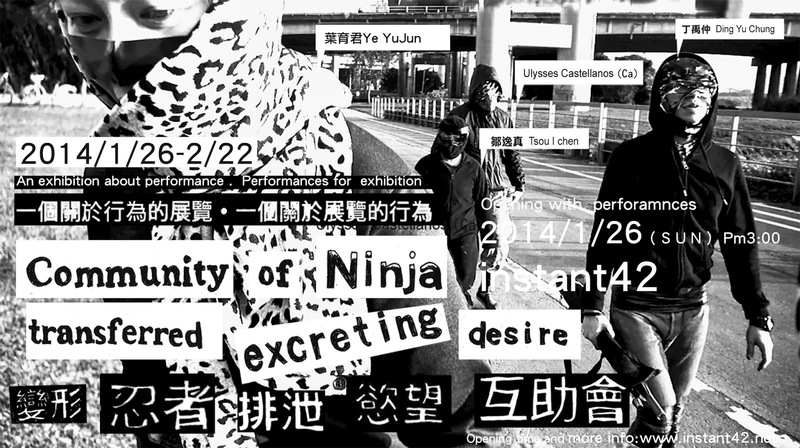 Four artists : Ding Yu-chung, Tsou I chen, Ye Yujun, Ulysses Castellanos Three Taiwanese, one Canadian, altogether four performance artists, four kinds of personality and four different forms of art work. One dinner party with four performance artists, which is also a guerrilla community. Four days, four subjects, four pieces. Through the tests of transfer, ninja, excrete, desire...challenging the limitation of artists' body conditions, as well as their conscious conditions. Artists help each other by participating other artist's performance, with this collaboration, we'll see unexpectable spark. Multidisciplinary Artist and Independent Curator. Born to a long line of artists, musicians, writers and intellectuals (he is the grandson of celebrated concert pianist Angelita Garcia Peña and Colonel Arturo Castellanos Contreras, who was honored in 2011 as one of the “Righteous Among The Nations” by Yad Vashem for his humanitarian efforts during WWII) Ulysses Castellanos developed an interest in art, music and literature at an early age. This interest led to extensive studies in film and music history, musical composition, visual arts and acting, manifesting itself in the multiple disciplines that Ulysses pursues (music, acting, critical writing, painting, filmmaking, video) and that he combines into elaborate installations, two-dimensional works, sculptures, videos and performances. In 2008, Ulysses completed the Telus Interactive Art and Entertainment Program at the Canadian Film Centre, where he worked with physical computing and interactive technology to create USB – powered interactive sculptures. He is a member of the IKT International Curator’s Association, Luxembourg, as well as The Society of Composers, Authors and Music Publishers of Canada (SOCAN). His work is shown extensively in galleries and screenings throughout North America, Europe, Latin America and Asia. In 2012 he completed Eco Hotel 2, a full-length mystery thriller set in the Colombian Jungle with a cast made entirely of resident artists from Residencia en La Tierra, Villavicencio. In 2014 Ulysses will complete production on his new film: The Hard Drive Was Missing, shot on location at Treasure Hill Artist’s Village in Taipei. Ulysses is represented by Georgia Scherman Projects, Toronto, and Galería Anomalía, Mexico City. Born in Taipei, Taiwan. In 2008 she obtained a bachelor's degree of fine arts, also of motion cinema from National Taiwan University of Arts. In 2010 she obtained another bachelor’s degree of fine arts from ÉSAD ( L'École Supérieure d’Art et Design Grenoble-Valence, France). Later in 2012, she obtained a master’s degree with premium grades from ÉSAD. Ichen’s works focus on body art, conceptual act art, video art. One of her video works won third prize in the Festival of video art in Paris, France, 2010, she is the only Asian of all award winners. In the same year, her short film was selected by 3th Festival Formosa film, Lyon, France, and later in 2012 the film was invited to play in Documentary Month, France. Since 2011, She joins tamtamART art association as curator. Her curatorial experiences including "Lose Weight Exercise", a joint exhibition in MPA-B 2011 annual program. As well as "Shaping Soul", a group exhibition of Germany, Austria, Taiwanese female artists. She had studied in France since 2001, and obtained a Master’s degree of Diplôme National Suprieurexpression Plastique from Ecole Nationale Supérieur d'Arts de Paris-Cergy and a Master’s degree of Art et Media Numérique from Paris1–Sorbonne. The forms of her works are mainly of performance arts, video installations, and sound performances, focusing on private and public spaces of bodies and public relations. During her time studying in France, she joined an international art group, Réseau Artskool, and learned dancing from Daniel Dobbels, a famous Franch choreographer. She has often been involved in cross-field cooperation with artists from other fields. Her works have been presented in Paris and Berlin several times. After returning to Taiwan in 2009, he has placed his focus on performance art in public spaces and the goal of “expanding the domain of art”, in hopes of bringing new possibilities to contemporary art through breaking the limitations on concepts and forms in the territory of art. His important works in the recent years include “City Action Series” (2009), “Treasure Palace Youth Hostel ” (2010), “Artistic Action & Record Exchange Movement” (2010, 2011), “Nippon International Performance Art Festival (NIPAF)” (2011), and “One Night Band” (2011-2012). He had joined the international art group Réseau Artskool, residing at Main d’oeuvre Art Center in France (2007) and resided at the Treasure Hill Artist Village (2010). Now she has a new art space called “instant 42” in Luzhou, New Taipei City, considering constructing and managing a space as a form in creation. This space is a complex art space with 3 major functions, art exhibition, studio, and artist-in--residence.